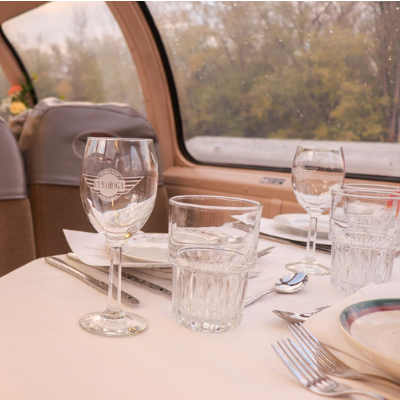 We invite you to enjoy an evening of fine dining on our beautiful California Zephyr train cars as they travel through Cuyahoga Valley National Park. 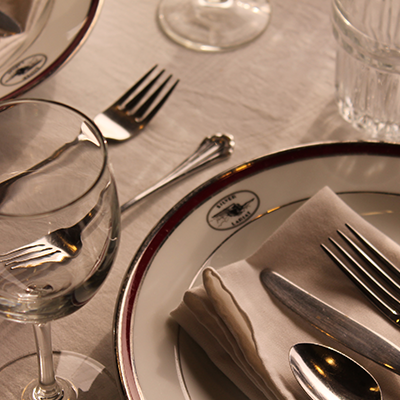 Dinner on the Train is our weekly dinner train that will transport you back to the golden age of railroading. Every Friday night passengers board the vintage Silver Solarium and Silver Lariat train cars to enjoy four-courses of executive chef prepared food. A complimentary bar is available for guests and wine will be poured throughout the courses. Guests will be delighted with remarkable cuisine in an unparalleled setting. The atmosphere on the train creates the most memorable celebrations for any special occasion. 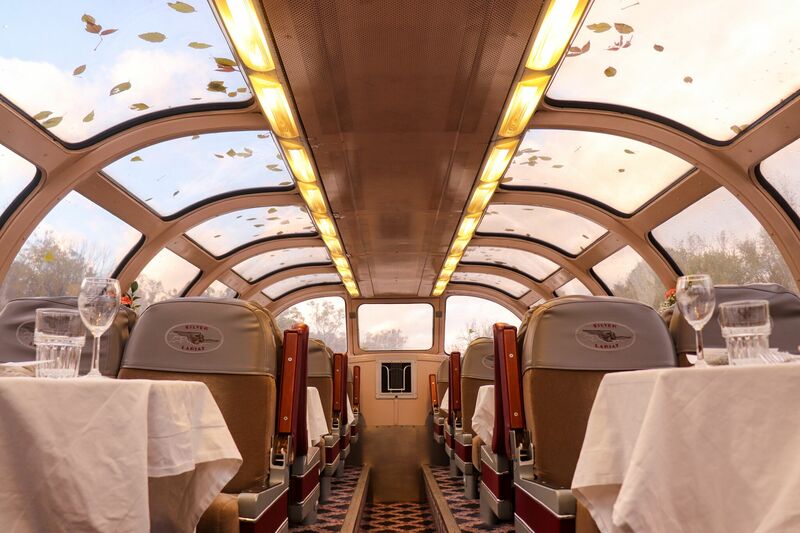 Our 1950’s renovated train cars are climate controlled and the exclusive setting lends itself perfectly to history buffs, old souls and romantics.
. No other dietary restrictions can be accommodated for. The excursion departs every Friday through October from Rockside Station at 7:30 p.m. 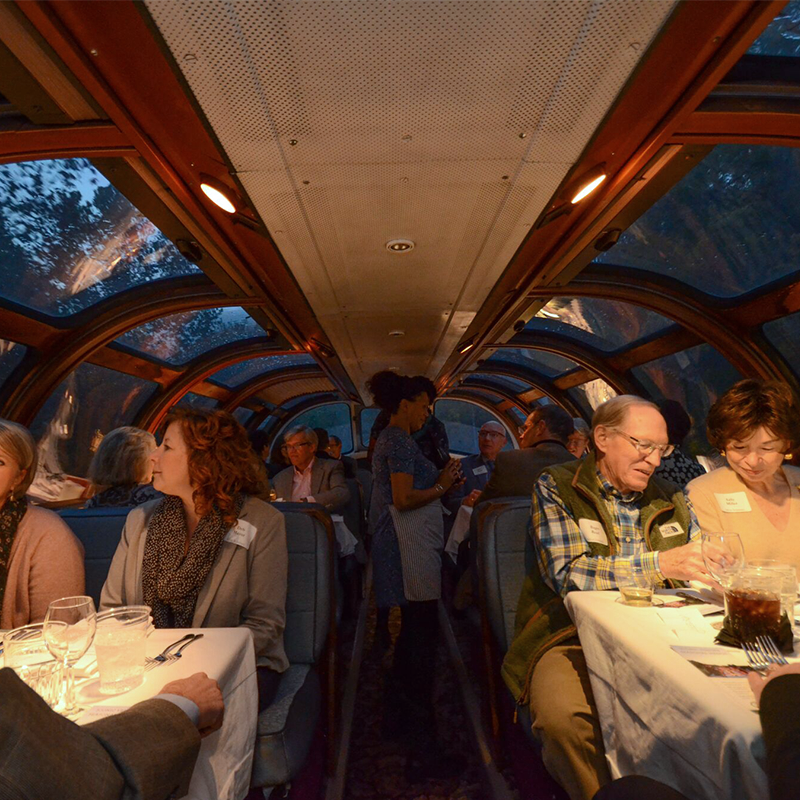 Guests are encouraged to board at 7 p.m. to enjoy cocktails, appetizers, and roam about the California Zephyr train cars. Ask CVSR volunteers about the rich history around, above and within the very train you are riding in! Excellent service awaits you as servers will be on board to walk you through every course. Don’t miss out on Dinner on the Train during Steam in the Valley! 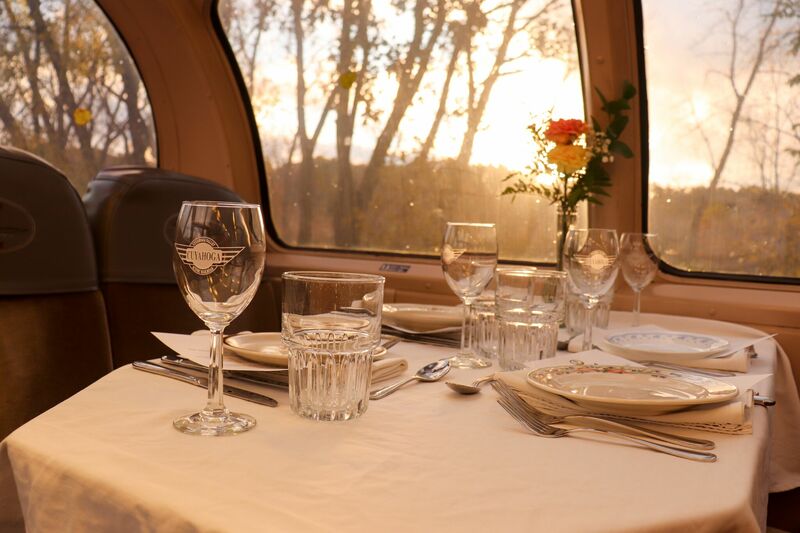 Not only do guests enjoy an elegant dining experience in the historic California Zephyr cars, but they get to do so behind steam engine 765 during the last two weekends in September. Dates for these special trips will be on September 21, 27 and 28. Tickets will go on sale in June along with tickets for Steam in the Valley. Members will receive early access to tickets. This excursion will depart from Rockside Station in Independence at 7:30 p.m. on every Friday from August 2 to November 1. Menu’s change bi-weekly. First class tickets are $105 per person. Upper Dome tickets are $115 per person. Tickets will go on sale for members on April 30 and to the general public on May 3. This excursion will depart from Rockside Station in Independence at 7:30 p.m. on every Friday from June 7 to July 26. Menu’s change bi-weekly, see ticket product for details or click here for all menu’s. First class tickets are $105 per person. Upper Dome tickets are $115 per person. This excursion will depart from Rockside Station in Independence at 7:30 p.m. on every Friday from January 25 to May 31. Menu’s change monthly, see ticket product for details. Tickets are $115 per person. Subscribe to our email list to be the first to know when more dates are added!